We will agree to disagree- it is not even close! Am I misinterpreting what you're saying? Are you saying driving while stoned isn't dangerous? There apparently have been a couple of studies done for states that recently legalized marijuana use. They indicated a very small increase in automobile accidents and no (statistically significant) increase in road fatalities. I can't imagine that marijuana-induced driving fatalities are ever going to come remotely close to those associated with alcohol. I suspect booze is going to continue to dominate road fatalities by a massive margin. People get fall-down drunk all the time. I've seen people get high on weed many times, but I've never seen them staggering around like a zombie. I don't know if that's because marijuana is less "potent" than alcohol or if it's because smokers are more likely to be content with just a mild buzz. Booze, reaction time, drunken stupor, etc. High on weed, I don't know, I never experienced it. Texting on cell phone, eyes off the road. Result is as fatal as the drunk so really, what is the difference, the motive? Is is a "hate crime"? Oh my the dreaded hate crime. Are not all crimes a mean spirited act against someone generally? Anyway, don't want to open a new can of worms when the current can is sufficient. Driving while eating, doing your nails (hoping no one here is guilty of that one), driving while picking your nose, driving while shouting at the kids in the back seat (turning around and smacking one of them), driving while think of Salma Hayack dancing in From Dusk till Dawn.....that sir is DISTRACTING. Pet peeve: when people write "trooper" instead of "trouper". Nothing major but it just bugs me. I doubt that most people know what a troupe is. Me: Do I get the part? Mrs psu_dad: No. You stink. As a follow up for travelers - my TTP application to renew took less than a month to process - got my new card in mail, thankfully before a trip last week and I am back in the expedited screening lane, I get to keep my shoes on and leave my computer in the case. The TSA pre check does save time through security especially at larger / busy airports if you get stuck travelling peak times. Even pulled a seat lottery win for a flight (empty row) and got a free rental upgrade from midsize to Jeep Grand Cherokee. And yes - when you business travel these are considered wins. I now don't know how I lived without TSA pre-check all these years. And, when my wife and I went to Seattle last August she got pre-check too. I guess it was non-guilt by association. The upgrades are huge wins. As a fellow business traveler, I completely get that. It's like you pulled one over on The Man. 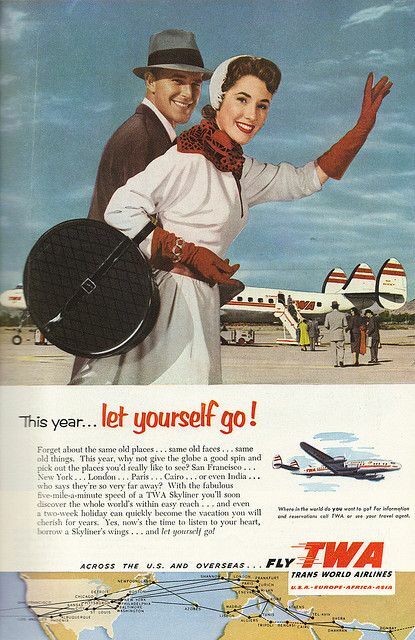 Hard to believe there was once a time when you could just stroll onto a plane like you owned it. 5 miles a minute? How old is that add? I guess the propellers on the plane are sort of a give-away that it's not a recent add. but, New York to Cairo at 5 miles a minute is no great bargain. That's still over 1,100 minutes. Anyone want to sit on a prop plane for 1,100 minutes? I wonder how much that woman was smiling on the back end of that flight.